Mental Illness is no laughing matter nor should it be something we should ignore either and it comes in all shapes and sizes but most of all it can affect us all. We sometimes think we understand the illness or selfishly think we have all the answers to curing the illness, in Shinya Tsukamoto‘s Kotoko it never tries to answer but instead shows the illness from the person we sometimes forget about from the perspective of the sufferer. 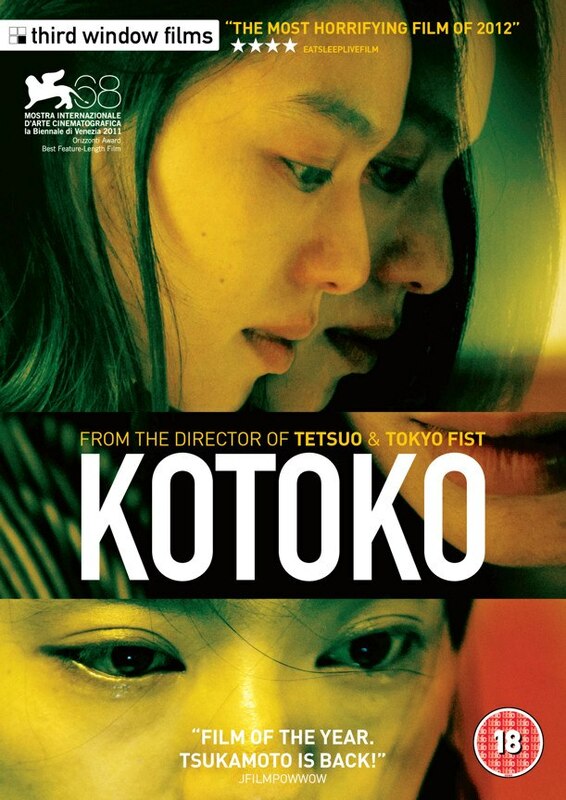 Kotoko (folk singer Cocco) is a young single mother who lives alone with her young infant son.Suffering from an unknown illness that makes her see things double especially people making things difficult for Kotoko impossible to know which person is really leading her to violently lash out. With things getting harder for her in the daily grind her day to day chores become harder making her a liability not just for herself but also her young son. Her son is taken into care (looked after by her sister) Kotoko is now on her own her frame of mind and broken is fragile her thoughts are dangerously scattered which makes it scary for all who share her life. From the minute Kotoko starts we’re thrown right into the chaos, the anguish of the film’s protagonist which sets the tone for the rest of the film. At no point of the film does it attempt to figure out why Kotoko’s mental state is what it is but taking us right into her mind giving us a voyeuristic look at the horror from the eyes of the sufferer herself. What really annoyed me with this film was the use of ‘horror’ not from the film itself but from some of the reviews I read some calling Kotoko a horror or J-Horror which this is the film is not. This is not a film of mythical creatures or found footage malarkey, this one does have demons but the inner demons of psychological proportions. Kotoko will hit you in the spot that will hurt you the most. It’s a visceral, raw intense nightmarish journey which will leave uncomfortable, disorientating but will leave you with an everlasting reminder that people with this illness are human beings and their pain is their cry for help. One of the success’ of the film is the central performance of it’s lead actress, Cocco. I’ve always been a little sceptical of films which have non-actors (sports, musicians) been picked especially in lead roles as sadly majority of the time history has shown it’s ended in disappointment. There has always been a few exceptions like Cocco and on the level of her début acting role in Kotoko has been nothing but incredible. Cocco really goes all out with a performance that really connects with you, it’s intimate but also very claustrophobic , truly cathartic all thanks her drawing on her own real life personal experience making this one work. Cocco her self-suffered from mental illness/ self-harm when she was younger though we never really know if it was intentional to use her in the role thanks to that dreadful part of her life it does give Kotoko a real genuine touch. As I said earlier the film never really delves into what triggered her suffering however when you watch the film you do get small glimpses what they might be with a lack of a father figure in her life (her own parents divorced when she was younger) which could be also the reason why there’s no father figure in her own son’s life either. Could the male population be the main reason, was she raped? Whatever you think the men who have entered her life including that good Samaritans don’t get a good ride here. What’s really touching about this film as well as being an inaugural part is Cocco’s singing within the film which gives Kotoko moments of escapism from her inner demons. As well as providing the film’s score (like she did for the directors 2004 film Vital) the music really adapts into film naturally reminding me of Bjork in Lars Von Trier’s Dancer Of The Dark giving the film a sense of tranquillity among the madness. Kotoko is a beautifully well-crafted film which will pull at your heartstrings as well as make it uncomfortable to watch but to appreciate the pain a sufferer has to go through we sometimes have to go to places we don’t want to go to. There’s a great David Bowie song called Fantastic Voyage which really sums this film up listen to it read the lyrics as it reminds us this illness affects us all, there’s no stereotypical profile of a sufferer just a stark reminder when the mind body and soul are fragile the world around us can be the most terrifying place to be in.